This game is a fantasy RPG. You must destroy the rifts where the monsters are coming from, each called a "Dark Gate." The hero Leo joins his ally Sandy on a mission to destroy the "Dark Gates". 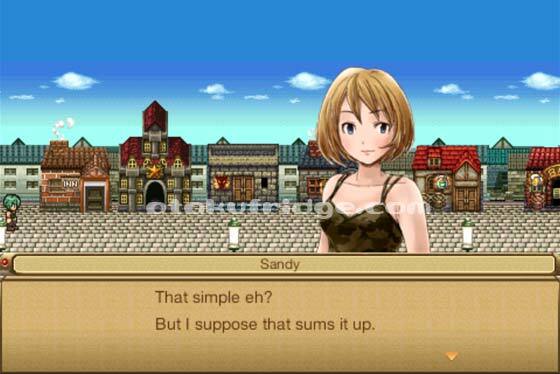 I was on a gaming slump when a friend mentioned that Final Fantasy Tactics had an iOS version. I don't own an iOS device so I ended up looking for classic jRPGs on my Android phone. That was how I first landed on the page of Kemco Games. I was delighted by what I saw, because many of their games' sample screenshots were reminiscent of old school jRPGs, though the art style is mostly tailored for 21st century gamers. 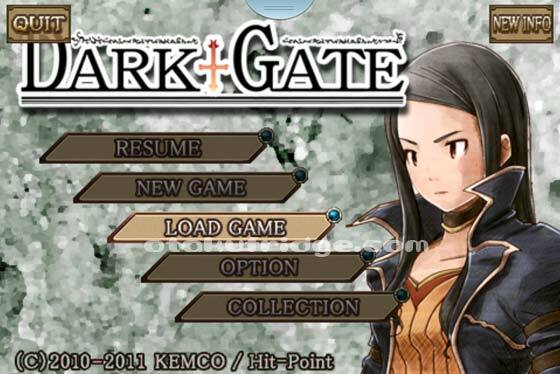 Dark Gate was on sale at approximately ¥300+ or $3.00 so I immediately picked it up. What I love about mobile gaming now is how portable everything is. More so than when portable consoles came out, so when I would play this game in the faculty room, the reactions of many of my game development co-faculty members upon seeing the graphics was full of nostalgic delight. And I'd get questions like, "OMG, what game is that? Where do I get it?" This elicited the same reaction from my colleagues in the game development industry. By no means is Dark Gate an old game. From the title screen alone, you will know that this game came out last year. But the sprites, the backgrounds, and even the music felt very much like I was thrown back to the days when I was first introduced to jRPGs. 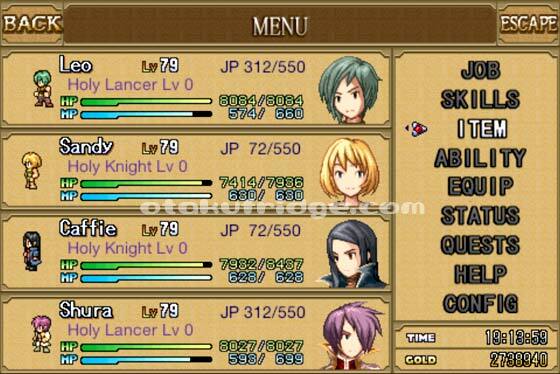 Dark Gate employs a job system where all your characters level up both themselves (LV) and their job skills (JP), as you can see from the screenshot below. There are so many tiers to these jobs, so it was actually fun mixing and matching them. I thought I wasn't going to be able to use all the available members, but it turns out that I maxed out my main party's jobs right before the final dungeon opened up so I used the other characters just for job skill point distribution purposes. My only major annoyance with this game is that the jobs aren't so balanced and though I did not feel like I did some grinding, my alternate team got to level 99 pretty quickly in the last 4 optional dungeons. I already set the difficulty to normal but it was still too easy. Looks like I have to buy a more challenging difficulty mode if I want to finish this game at a much lower level, though the thought of buying in-game options isn't such a bad thing, considering the massive content that's available to me at only ¥300+. That's the price of one Venti Starbucks drink so I'm not complaining. There will be some difficult enemies, which you can't physically damage, on the first parts but these only serve to make you realize that you need to make use of other jobs. For instance, if you're a player who loves using physical attacks, like me, you'd now be forced to turn your party into magic casters. The game basically teaches you without the overly intrusive tutorials that seem to have defined much of the newer games. The dungeons are also pretty standard classic jRPG fare. The design, however, has a more balanced progression. 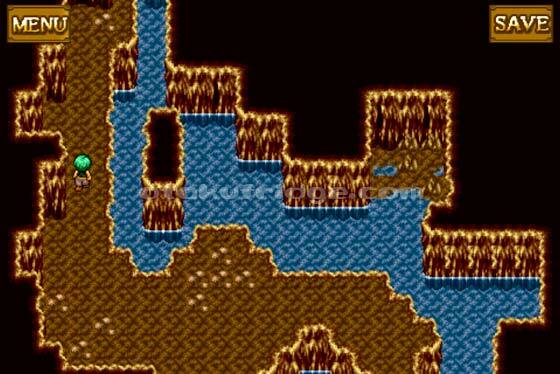 If you remember, older jRPGs already have intricate mazes from the first dungeon onwards. This one starts out pretty easy and the intricacies of the dungeons build up as you go through the game. I wish they'd make leveling up a little bit harder from levels 50 and above, though. The last few dungeons are so long that my alternate party, with all members staring at level 1, exited 2 optional dungeons at level 99. Notice I actually had to use an alternate party because I didn't want my main party to become too strong when they meet the final boss. It was useless, because the final dungeon had so many mazes that not a single character in the entire game was below level 99. Now for the most nostalgic part: There are no FAQs available for this game. It's just like when I was playing my first few RPGs and the internet wasn't the noisy place that it is now. You will have to figure things out on your own. The good thing here is that there are no save points, which means you can save right before a boss battle and then try different combinations of skills. 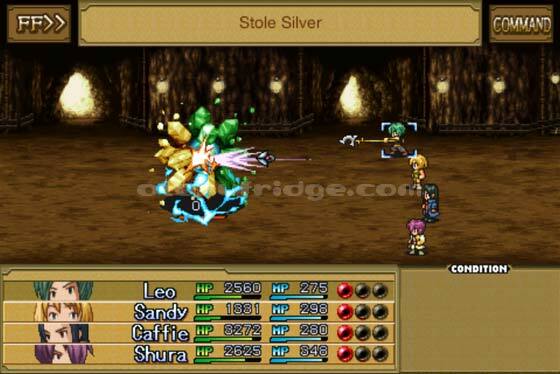 There are some bosses who will only be affected when you combine two kinds of magic or two kinds of physical attacks. There's also the fact that each boss has a different strategy, so you'd end up either thinking your strategy through or doing a lot of trials and errors. Overall, Dark Gate is such a fun trip for retro-gamers like me. If it weren't too easy, I would have given it a 10.